Unforgettable Houseboats | Houseboat hire - Murray River - Perfect houseboat holidays! 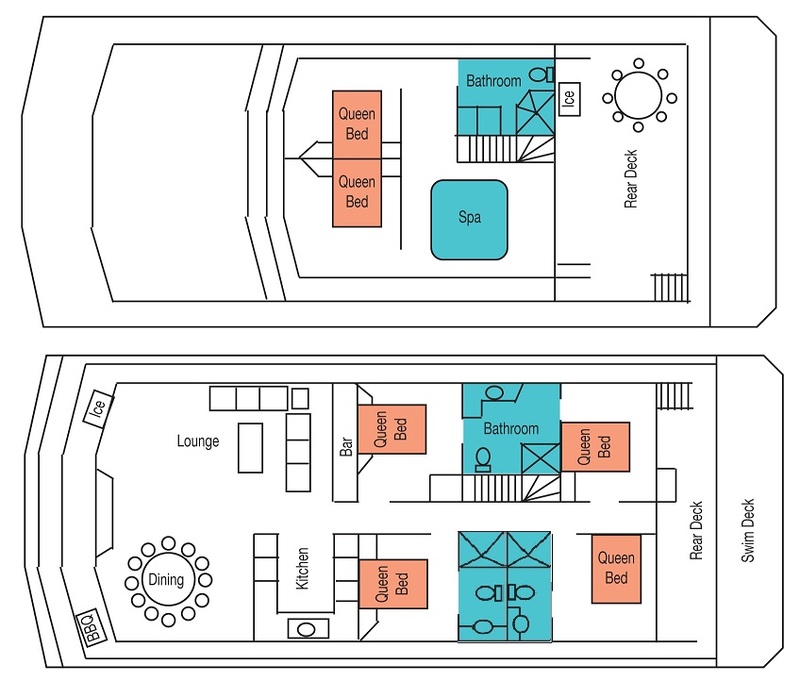 This magnificent craft features complete luxury afloat and its complete design and concept in houseboating leaves you wanting for nothing, whilst relaxing on one of the perfect houseboat holidays. Downstairs enjoy the comforts of the four queen size bedrooms with ensuite facilities via the four fully tiled bathrooms offering comfort and privacy. The state of the art entertainment system features 102cm Flat Screen Colour TV, DVD, 5 stacker CD player and Pioneer Home Theatre System with Surround Sound! The fully equipped gourmet kitchen once again featuring granite bench tops boasts such features as dishwasher, microwave, maxi-size 530 litre electric fridge/freezer, gas oven and hotplates. There are a further two bedrooms complete with queen size beds and panoramic views of the river. The fourth bathroom features washing machine, tumble drier and also offers ensuite access to the penthouse bedroom. Houseboat hire on the Murray River has never been easier! What more could you ask for? Check the available dates below and book your holiday now. Click on the Floor Plan images above to see an enlarged image.